Regular readers already know that I don’t pitch the handles of disposable foam brushes when they are used up. 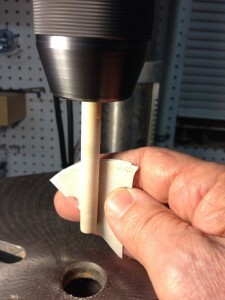 And, we’ve previously discussed using those 3/8″ diameter handles as guides for installing sanding disks onto random-orbit sander pads. Lately, though, I’ve run into some handles that are a little rough on the outside. I’ve begun to chuck them into the drill press and sand to 400 grit to make the job easier and faster. Run the speed up pretty high and it will take only a minute or so to get a perfectly smooth surface with a scrap of 400-grit paper. Swap ends and smooth the entire rod. Be conservative with chuck pressure. 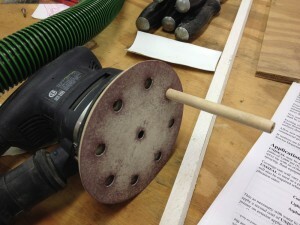 The handle slides into the sander’s pad more easily, and the disk glides down into position with less effort, too.